FURTI E FRODI AGLI ANZIANI, COME DIFENDERSI. » Eventi » FURTI E FRODI AGLI ANZIANI, COME DIFENDERSI. FURTI IN ABITAZIONI E REATI PIU' FREQUENTI IN DANNO DI PERSONE ANZIANE: COME PREVENIRE E DIFENDERSI. 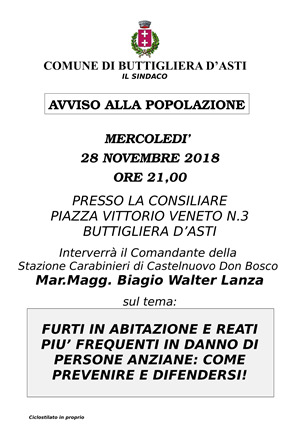 MERCOLEDI' 28 NOVEMBRE 2018, ALLE ORE 21, PRESSO IL SALONE CONSILIARE, PIAZZA VITTORIO VENETO, 3 (MUNICIPIO), INTERVERRA' IL COMANDANTE DELLA STAZIONE DEI CARABINIERI DI CASTELNUOVO DON BOSCO (AT), MAR. MAGG. BIAGIO WALTER LANZA. SARANNO, INOLTRE, PRESENTI: IL SINDACO FRANCESCA CAPELLINO E IL COMANDANTE DELLA POLIZIA LOCALE, VICE COMMISSARIO LUCIANO BADOLISANI.